Contact Steve Art to be on the list to receive the Economic Development Newsletter. The Zoning Code regulates the size and location of signs throughout the City of Wheat Ridge. This handout summarizes requirements for the most common types of signs in standard commercial, industrial, and mixed use zone districts. This handout does not address all types of signs; please refer to Section 26-709 to 26-711 of the Municipal Code or contact the Community Development Department. Please contact the Community Development Department for specific regulations or to ensure that your proposed sign conforms to the code. Jeffco Business Resource Center Offers Resources for you! 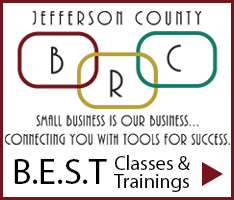 Jeffco Business Resource Center (Jeffco BRC) offers workshops and events for both startup and seasoned businesses in Jefferson County. Many workshops are offered with FREE of charge. Please visit Jeffco BRC website to see the events they host and take advantage to grow your business.